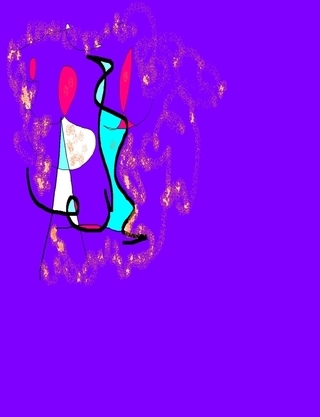 E-Book of poetry and abstract art! Click to see a preview or to purchase & download now. New! Sing the Planet Electric is a 32 page E-Book and PDF download containing national award-winning and nationally published poetry that has been illustrated with delightful color abstracts. It contains a sampling of some of the most often requested, beloved poems which were taken from the 137 page hard copy edition of Eight Frames Eight, poems. I wanted to make a book containing some of my most requested natural earth poems so that my readers could read and enjoy them in most of the electronic media available today, and I insisted on publishing a poetry book that was suitable for these recession economy times. After a lot of thought, I realized that an E-book would to meet all my requirements. It had be as lavishly colorful and as beautifully print-crafted for the eye as an expensive hard copy book; it had to be a cinch to download to most computers, PC or Mac. Most of all, the book had to be very economically priced so that it cost only pennies a page. I want more people to be able to afford the wonder of poetry for their own inspiration, and to be able to gift their favorite poetry to loved ones and friends, because that is what I deeply believe poetry is meant for: inspired communication. This E-book is a PDF file that can be read on any PC or Mac computer, the Apple iphone, and many other Medias types as well. No special E-book reader is required!